When it comes down to comparing breeds, the difference between Yorkie and Silky can only be defined by breed standards. Individual dogs can vary from breed standards, even if they are purebred dogs. The Yorkie is a ‘finer’ dog, meaning his bone structure is smaller, his fur is finer, and he is overall a few pounds smaller than his very close relative, the Silky. Finer fur tends to grow a bit longer, and is accustomed to being matted, often on a daily basis. The Silky tends to be larger, with a broader bone structure. His fur doesn’t mat as easily, because it tends to be just barely thicker, and often doesn’t grow much more than a mere 4 inches. Both dogs still require daily grooming. The Yorkie is also more likely to be the heavier shedder between the two breeds. Yet, comparatively speaking, neither dog qualifies as a heavy shedder like many of the larger breeds. When touching the fur, the Yorkie has fur that is so fine and soft that it literally feels cooler than your hand temperature. The coarser fur of the Silky comes from the related ancestry of the Australian Terrier. While both breeds definitely carry a stubborn streak, the Yorkie is most definitely the stronger-willed of the two dogs. He is more adamant about getting his way, and finding ways to get what he wants, even if it means getting into trouble. The Silky is considered a strong-willed dog, but is easier to train, and is more likely to work for the pleasure of his human, than solely for treat rewards. The Silky has a more distinctive profile, as his snout and his head are larger and more prominent than the Yorkie. They call the Yorkie a ‘square’ breed, which means that, proportionally, he should resemble the square. His body length should be almost the same measurements as his height. The AKC requires that he weighs no more than 7 pounds, and his measurements shouldn’t be more than an inch off. The Silky also has larger ears. They rest farther back on the head than the Yorkie’s smaller ears. The Yorkie and the Silky are different breeds. They are not the same breed, but only labeled for just their size difference. A large Yorkie is a still a Yorkie. Noa A. "Difference Between Yorkie and Silky." DifferenceBetween.net. 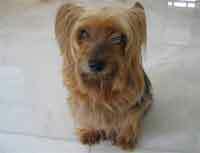 January 30, 2010 < http://www.differencebetween.net/science/nature/difference-between-yorkie-and-silky/ >.